Why Do Hurricanes Go Where They Go? Have you ever wondered why a hurricane goes where it goes? What makes it move in one direction as opposed to another? Why do some curve or make loops and others seem to have a constant direction? 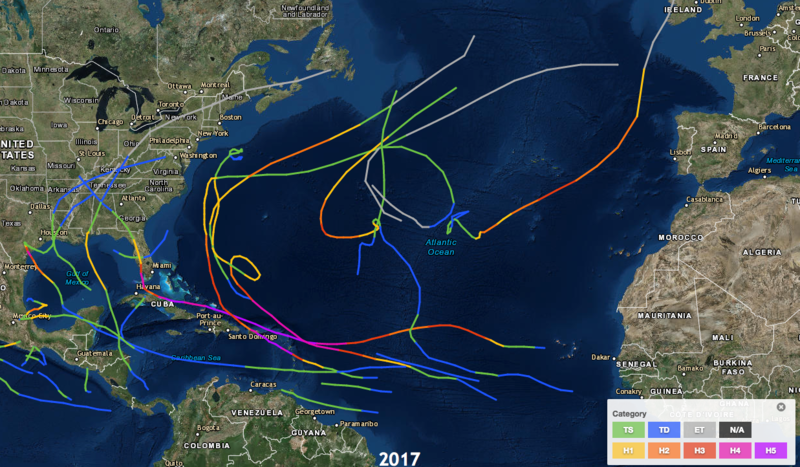 The image below shows the path of tropical cyclones in 2017. Some interesting tracks show up! Jose made two loops before fizzling out off the east coast of New England. Harvey came inland, before heading back into the Gulf and reentering along the Texas-Louisiana border. Arlene made a full circulation in the middle of the Atlantic and Ophelia headed straight for Ireland after some initial confusion. To explain the path of tropical systems, let's first talk about this image. Here you can see the icy water is taking the path of least resistance as it moves downstream. Some of it is going straight while other parts of the stream are flowing on either side of the boulders in the center. What you don't see is water hopping over the large stones. But what if the rocks did become mobile? Maybe the water would become trapped in an area, forcing it to switch direction, but it would continue to move. Now, let's imagine that those boulders are high-pressure systems and the water is the general atmospheric flow. Within the flow is a hurricane, in this case, it is Florence (and the future Helene and Isaac). Watch how the high-pressure areas move and grow. As they do, the tropical cyclone, a low-pressure area, is not creating its path. It instead shifts direction to take the path of least resistance around the high-pressure system. The larger the high, the more effect it will have on this tropical system. There are plenty of other factors that come into play concerning the strength of a cyclone. Wind shear plays a big part in that. But if you want to know where a hurricane is going, check the pressure field.